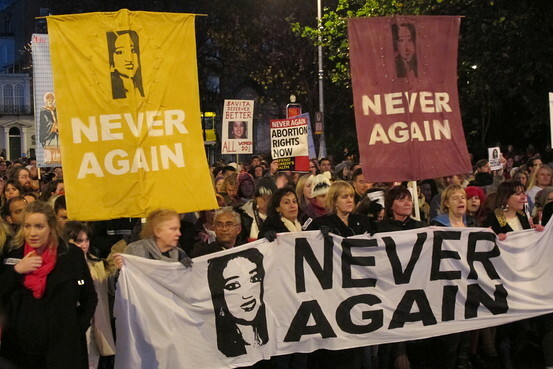 Ireland looks set to legalise abortion this week, albeit in very limited circumstances. According to The Guardian, the numbers are stacking up in favour of the reforms that will allow abortion when a woman’s life is in danger or when a woman is at risk of suicide if the pregnancy continues. If a woman asks for an abortion on the latter grounds, she has to be examined by three doctors. The doctors would have to unanimously agree that she was at risk of taking her own life, before the termination was granted. The last series of votes on the bill are expected to take place in the coming hours. The reforms were introduced after Savita Halappanavar died in hospital in Galway in 2012 after being denied a termination. She began to miscarry at 17 weeks, but was refused a termination. By the time the foetal heartbeat had stopped, Savita was dying of septicaemia. Savita was allegedly denied the termination on the grounds that Ireland was ‘a Catholic country.’ However, it appeared that the hospital overlooked the 1983 amendment to the constitution that says the unborn has an explicit right to life from the time of conception except when it is performed to save the life of the mother. The hospital argued that the laws surrounding termination were unclear. It is hoped that the current round of legislation clarifies women’s rights and prevent further tragedy, though this may not be the case. The bill still classifies abortion as a criminal offence. This entry was posted in News and tagged abortion, in brief, ireland, suicide, women. Bookmark the permalink.